Kids love to see their artwork displayed... at least MY kids love it! I might not get an award for the most aesthetically pleasing art display in my home, but since I am decorating for my family, and for OUR tastes, then that is all that really matters to me. A couple months ago, my oldest, Scott, had a few friends over for a sleepover. We had some extra time the next morning, so I pulled out some painting supplies. 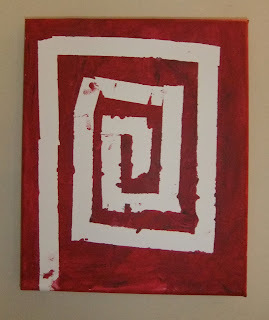 My middle son, Todd, did this painting by masking some areas with masking tape before he covered the whole thing in red. I find this painting so striking and I just absolutely love it, so it is hanging in our main hallway. Another area in our house that is heavily art-ed is the stairwell heading to the basement. 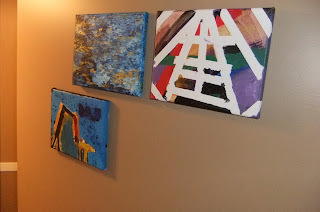 Art by my kids, my husband, my mom, me, some photography, and more. 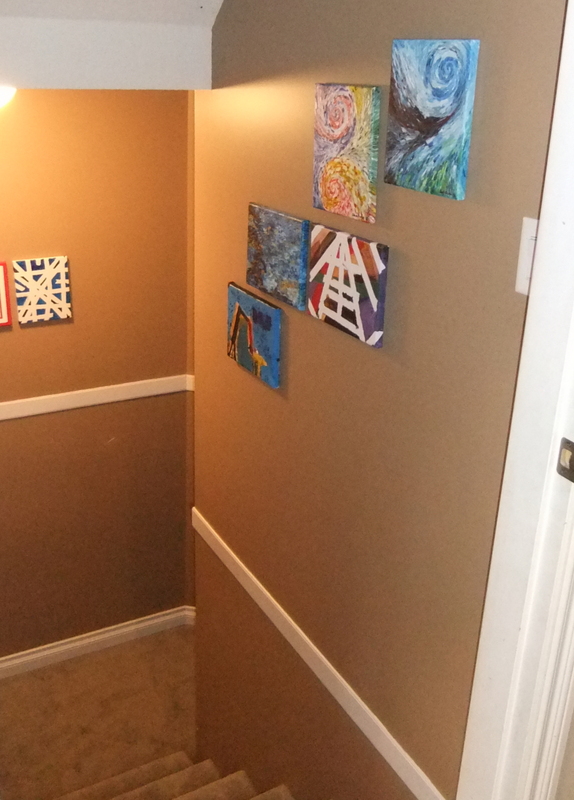 It is like a mini gallery. I would love the walls to be completely covered in originals! Last year, I taught a series of children's art courses. 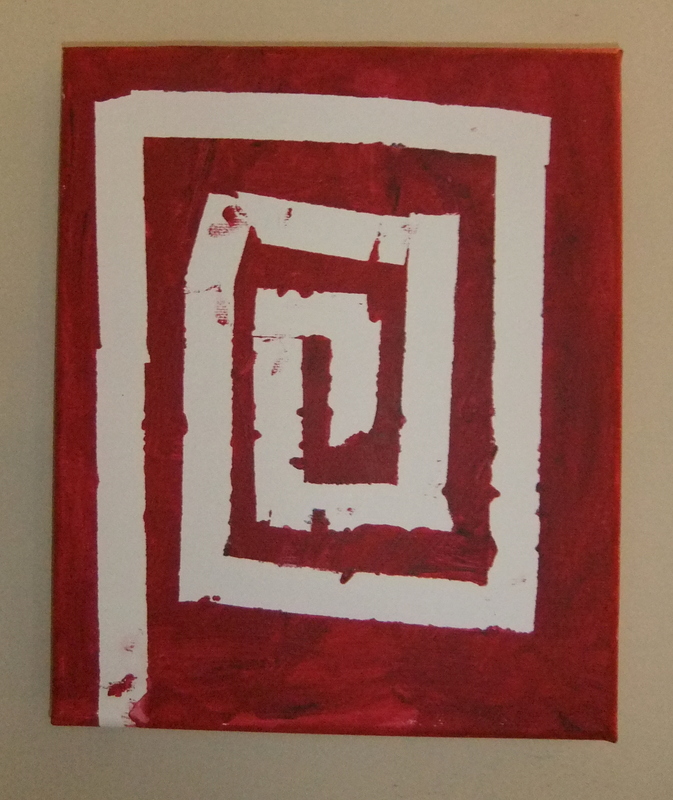 Often, at the end of the class, there would still be acrylic paint leftover, so I would sit for an hour, on my own, and have fun with the paints and a fresh canvas. Canvases are super cheap. Sure, you can get the uber-expensive ones, but you don't need to when these canvases (which you can pick up at a local arts and crafts store for about $1.50 each, on sale) work great. Some of my acrylic paints are student quality (inexpensive) and some of them are artist's quality (not inexpensive! haha!). I let the kids use all my supplies, however, I do NOT let the kids dish out their own paint. That is always my job because we go for minimal waste. My daughter did two of these, and I did the other one. On one artistic evening, my husband jumped in on the fun, as well. 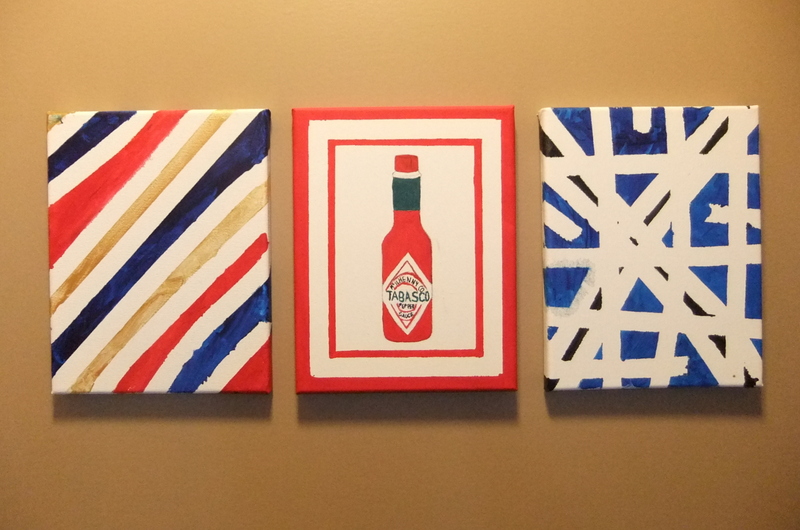 His masterpiece is the Tabasco bottle in the middle. If you are paying attention, it is the first thing that will catch your eye as you go down our stairs. I was so impressed that I wanted it to be a focal point. The boys each did one of the paintings beside Steve's. What about artwork that comes home from school? Well, it needs to be displayed, too. Some people choose the fridge. We do not choose the fridge. In our mainfloor hallway, I have strung some hemp twine between two pins and put a bunch of clothespins on the line. 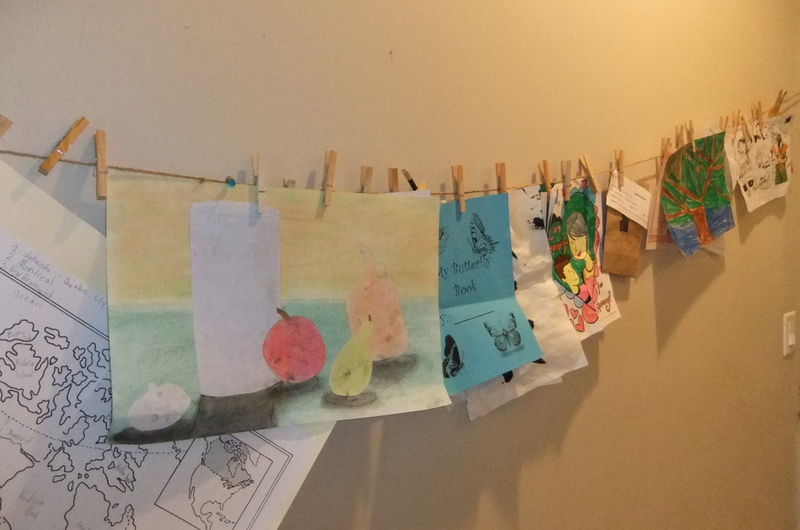 Throughout the year, as masterpieces come home, I get the kids to "put it on the clothesline!" They go and display their art, proudly. From time to time, I remove the artwork. Some gets stored in their school drawers until the end of the school year (a cabinet in our hallway that holds treasures from the current school year). During the first week of summer, we go through these drawers and glue anything worth saving (we don't keep spelling papers, usually... and sometimes not even math sheets!) gets glued into a scrappy scrapbook for safe keeping forever and always. Something I would like to try is the revolving art display in picture frames. I've seen amazing examples on Pinterest, like this one. And this one. And even this one that allows you to keep several pieces in one. Very fun, and something that might be a future addition to our artistic home.